Never have I liked a story so much and yet skimmed so much of the book. 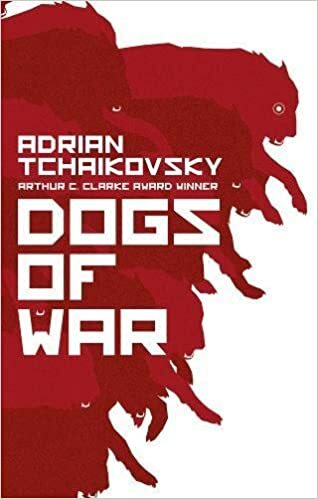 In Dogs of War, humans decide that war was too costly, so they create "bioforms" -- things that start out as animals but are geneteched to become half-human soldiers. The story follows Rex, a dog bioform. This book had two stories in it. The first was Rex's personal arc of going from what was basically an unthinking machine to a real person. And boy did I LOVE LOVE LOVE that story! Not only did he have to overcome his geneteching (which only wanted obedient slaves), he had to also overcome a dog's drives to make its master happy. I completely believed him as part dog, his feelings and thoughts and reactions seemed perfectly accurate. The larger story didn't work for me as well, but perhaps only because I loved the more personal story so much more. While Rex was trying to grow and better himself, the whole world had to deal with what bioforms are -- not robots, bioforms could think and had feelings. And, while mentally limited, they could talk. What makes a person? Who deserves rights? Nations had to make a similar trip as Rex himself was making. Rex's story was so great, I actually cried at the end. But all the chapters about humans and nations and all the legal battles? More often than not, I just skimmed those. I'm starting to think that "old" books just don't work for me. When I mentioned that I hadn't read this book yet, multiple people recommended it to me. And, if I had been betting money, I would have bet this book would completely work for me. As a kid, 'toys coming to life' was probably my most common fantasy to play out. And yet this story fell flat for me. Perhaps because it was British, perhaps because it was dated. All these old books always seem to lack something for me, something I can't define better than they're missing a spark -- they seem flat. Maybe it's just a difference in writing stiles across decades... I wish I knew. 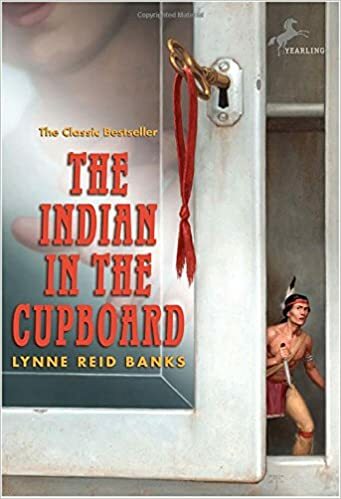 While I suspect everyone knows what this story was about, in it a boy put a plastic indian into a cupboard, and through some unknown magic, it came to life. I didn't like the boy's character. The indian was a caricature. I didn't like the boy's best friend. And, perhaps worst of all, I didn't believe the parents as real people. Maybe I was just expecting too much from a book for children... I stopped reading at 47%.